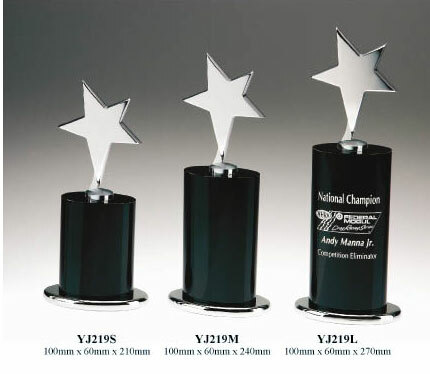 Elegant top of the range trophies and awards recognising all forms of achievement and success which can be customized and engraved with your logo and text. Chrome Star on Optical Crystal. A real Star at the top of the range. Comes in 2 sizes 220mm & 270mm. Lots of engraving space. Comes in presentation gift box. Chrome abstract on Claer optical crystal base. A step above the rest that recipients will treasure and appreciate always. Comes in 2 sizes 200mm & 250mm. Presented in Gift box. Abstract Flame on Optical crystal piece. Comes in 2 sizes 230mm & 260mm. See if they have the burning desire to win this one. Presented in elegant gift boxes. Chrome on optical black crystal. Really elegant piece. 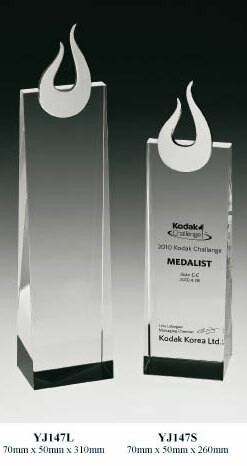 Can be used for various awards. Rectangular Optical crystal on metal base. One size only 125 x 45 x 215mm.. Tons of engraving space. 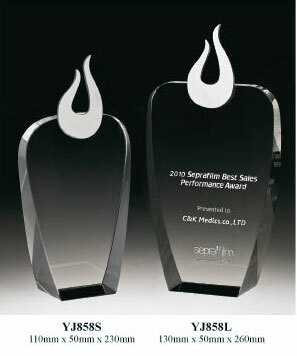 A great eyecatcher and large award. Comes in elegant gift box. Clear optical crystal world globe mounted into black optical crystal rectangle. 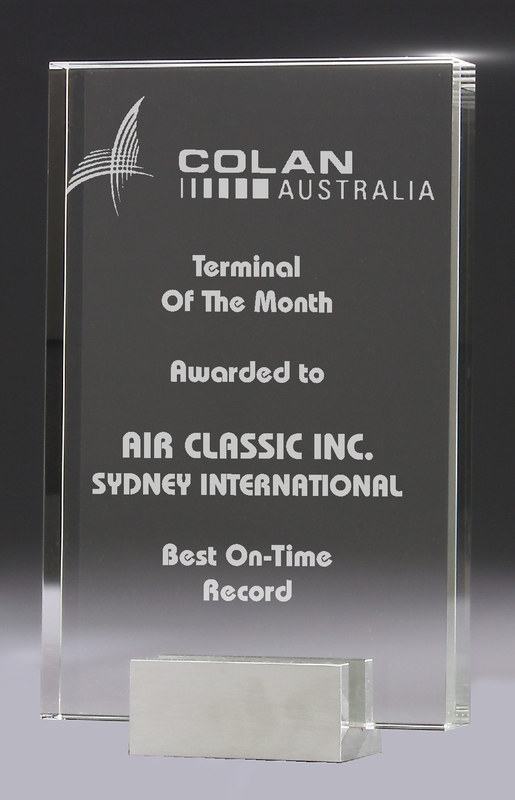 A great "global" award. Available in 2 sizes 80 x 50 x 160mm & 80 x50 x 210mm. Presented in elegant gift box. 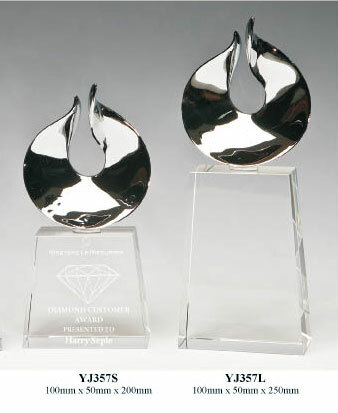 Very elegant tapered edge optical crystal rectangle on chrome base. 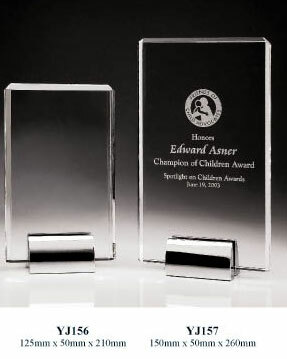 Heavy award that has lots of engraving space. Comes in 2 sizes 125 x 50 x 210mm & 150 x 50 x 260mm. Presented in elegant gift box. Chrome Goddess with high star on Black optical crystal base. The star of the range. Available in 1 size 100 x 85 x 290mm. Presented in elegant gift box. Chrome Eagle on Black optical crystal base with chrome stand. 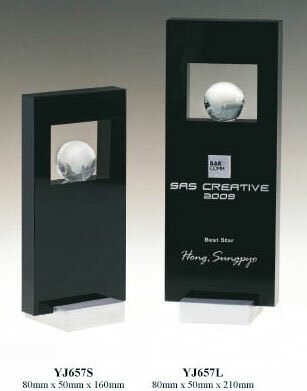 The award which recognises the recipient soaring to great heights. Available in 1 size only 100 x 30 x 330mm. Presented in elegant gift box. The world is your Oyster. 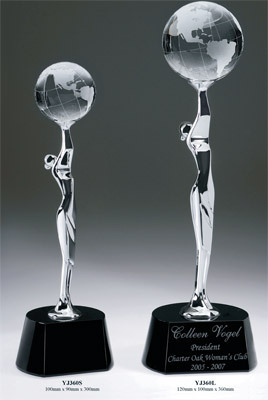 Optical crystal globe on chrome figure mounted on to black optical base. 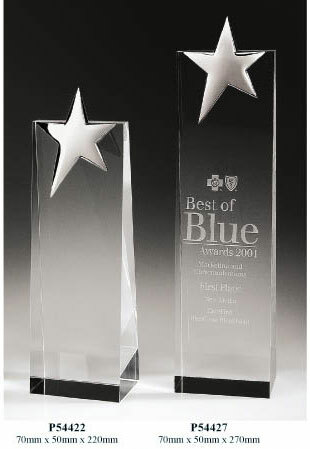 available in 2 sizes 100 x 90 x 300mm & 120 x 100 x 360mm.Presented in elegant gift box. Combination of Chrome, Clear Optical crystal and black optical Crystal. 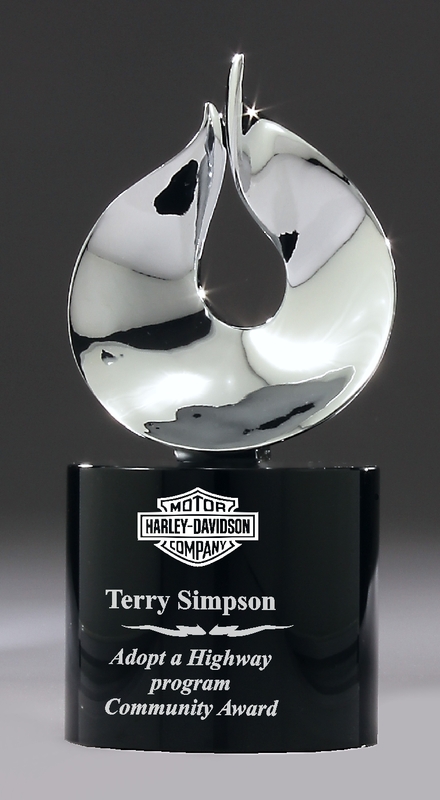 Real stand out Award. 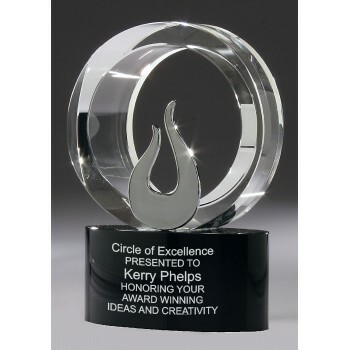 "Make someones award really special"
Chrome Star on black optical crystal base secured by chrome circle. Available in 3 sizes 210mm, 240mm, & 270mm. The Real "star" of the Collection. Chrome Star on Optical crystal. 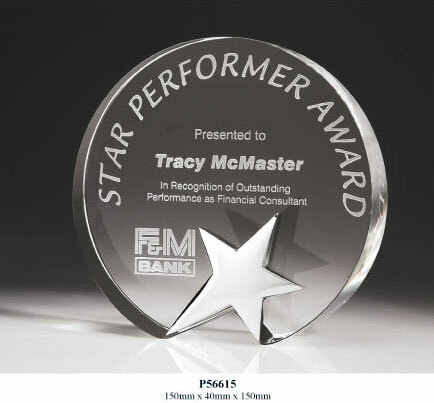 The Ideal all round "Star" award. One size only 150mm circle. Chrome Star on rectangular Optical Crystal. The real Star of the range. 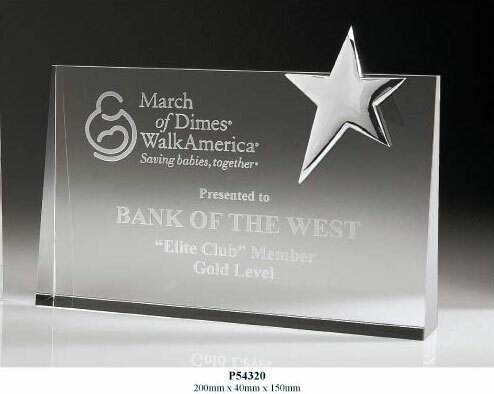 One Size 240mm x 150mm.Lots of engraving Space. Comes in Satin lined gift box.